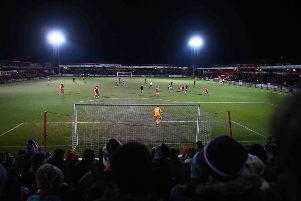 Luton Town’s resurgence continued in some style last night as they enjoyed an excellent 3-1 win at Morecambe. At a ground where the Hatters struggled badly last year, going down 3-0 with barely a whimper, this was like chalk and cheese, as Town produced a display full of aggression, passion and no little class too. The victory was Town’s third in succession, lifting them to 11th in the table and they can now go to an out of form Hartlepool on Saturday, with every chance of extending their run. Luton boss John Still made one change to the side that beat AFC Wimbledon, Scott Cuthbert replacing Stephen O’Donnell. Hatters started with positive intentions, Craig Mackail-Smith curling a shot into the gloves of Barry Roche inside the opening 60 seconds. The visitors were rewarded for their attacking approach on 12 minutes too when Josh McQuoid teed up Olly Lee and his left-footer was bravely blocked behind by Alex Kenyon. From the resulting corner, Hatters were ahead as Luke Wilkinson breezed into the box far too easily and directed a downward headed beyond Roche. The hosts threatened an immediate leveller as Luton backed off Paul Mullin and his right footer fizzed inches wide, while Kenyon’s free header from a set-piece was tipped over by Mark Tyler. Morecambe’s spell of pressure was rewarded with an equaliser on 25 minutes though as a cross ran across the area where Tom Barkhuizen nipped in ahead of Scott Griffiths to slot home. However, Luton were back in front a mere two minutes later as Paddy McCourt went on a wonderful slaloming run and when his low shot was parried by Roche, Cameron McGeehan followed up to slam home. The visitors then had to withstand a spell of pressure, as Barkhuizen’s low shot was easily saved by Tyler, while Cuthbert produced a wonderful saving tackle to deny Aaron Wildig. With Morecambe bringing on the veteran Kevin Ellison for the second half, Hatters looked to have rediscovered their control of proceedings and had a marvellous chance for a third. McQuoid robbed the stumbling Shaun Beeley in the area, who was fortunate to escape with a handball, and although he could and should have gone for goal himself, found Mackail-Smith who lofted well over. Town were keeping their opponents at arms length for large periods, with Barkhuizen’s curler from distance their only effort of note. That appeared to buoy the hosts though and with Ellison to the fore, they were desperately close to a second equaliser as Barkhuizen’s shot was parried by a surprised Tyler. Andrew Fleming’s follow up cross looked to have been turned past his own keeper by Wilkinson only for the keeper to pounce on the loose ball after an almighty scramble with Shrimp screaming for handball. Shrimps then thought they had a leveller when Ellison crashed a volley into the roof of the net but crucially for Luton,the offside flag was raised and the goal was disallowed. Luton swapped the marauding McCourt, who continues to show his class with every game, for Nathan Doyle as they looked to shore up their midfield area. With Town’s defence outstanding in the latter stages though, led once more by skipper Steve McNulty, they put the result beyond doubt in the final seconds. McQuoid and Lee combined on the wing to find the run of Jonathan Smith. He muddled his way into the area, firing a shot that was saved by Roche, cannoned back off the midfielder, hit the post, with Smith gleefully firing home from matter of inches. The strike will never come close to winning any goal of the season awards, but that mattered not a jot as Luton saw the game out without any further alarm, as they continue to shoot up the League Two table. Shrimps: Barry Roche, Shaun Beeley (C), Alex Kenyon (Shaun Miller 80), Adam Dugdale, Ryan Edwards (Jamie Devitt 73), Tom Barkhuizen, Lee Molyneux, Paul Mullin (Kevin Ellison 46), Aaron Wildig, Andrew Fleming, Andy Parrish. Subs not used: Kieran O’Hara, Aaron McGowan, Alan Goodall, Charlie Bailey. Hatters: Mark Tyler, Scott Cuthbert (Alex Lawless 84), Scott Griffiths, Steve McNulty (C), Luke Wilkinson, Olly Lee, Jonathan Smith, Paddy McCourt (Nathan Doyle 78), Josh McQuoid, Cameron McGeehan, Craig Mackail-Smith (Jack Marriott 90). Subs not used: Elliot Justham, Dan Potts, Luke Guttridge, Danny Green. Hatters MOM: Steve McNulty. Defender was a pillar of strength particularly in the second half up against Kevin Ellison.